She proudly changed her name on Instagram, a couple of months after marrying Justin Bieber. And Hailey Bieber, née Baldwin, was relishing being a family with her husband of six months on Sunday. The 22-year-old model shared a picture with the pop star, as they relaxed on a luxury yacht, which she simply captioned: 'The Bieber's'. 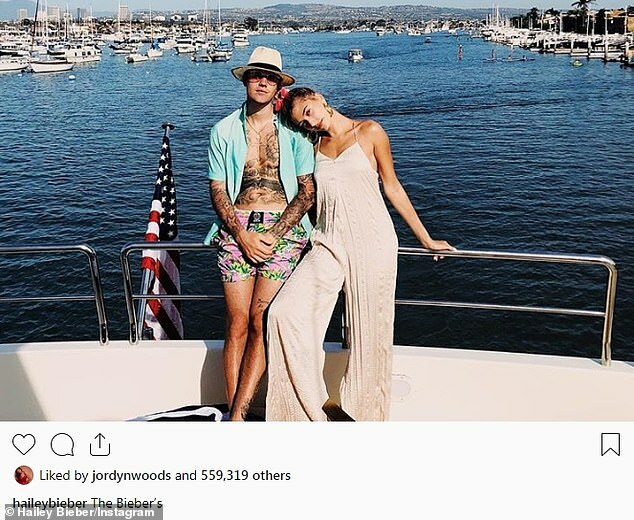 It's likely Hailey actually meant, 'The Biebers' plural, as they were both pictured aboard the luxury vessel, which appeared to be in Newport Beach, California, unless he had purchased the boat. She looked stunning as ever in a stone coloured strappy jumpsuit, which had wide legs. The Beauty was resting her head on Justin's shoulder, and had her hair in a tight ponytail.